All sixty series Goodyear Polyglas RWL tire sizes are identical in design with the noted exception of N/S & E/S. Note: For all tires each ½” change, + or -, in rim section width will result in a .2” change in the inflated tire section width. E/S – Tire size elevated in small solid raised white letters and numerals. N/S – Tire size not elevated in small solid raised white letters and numerals. N/S – Where required, thru 10/31/69. 11/01/69 thru 12/31/69 may be used with ES tires. 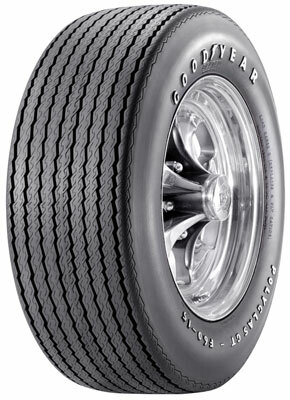 ES –11/01/69 thru 12/31/69 may be used with N/S tires. 1/1/70 forward only use ES tires. Construction: Two plies of polyester combined with two circumferential belts of fiberglass. F70 x 14" RWL Opt. (1) Opt. (1) Std. Std. (1) H. D. brakes or disc brakes and H. D. suspension required. (2) No – cost option. (3) N. A. Trailer – Towing package. (4) Collapsible spare tire required except on convertible. (5) N. A. with air conditioning. The information below applies to tires only, not other products such as our wheels. Our Prices Include Shipping Charges except for Goodyear, Premium Sport and Vogue Tires. No Hidden Fees or Trick Charges. Friendly advice is a telephone call or email away. *Please order your tires carefully. Let us help you. If you need to return tires and it is not our fault, there is a 20% re-stocking fee. Tires must be returned in the same condition as shipped and not mounted. We cannot accept tires that have been mounted. Shipping costs are the responsibility of the customer. Copyright Truespoke® Wire Wheels and White Wall Tires. All Rights Reserved. eCommerce Software by 3dcart. Goodyear, Premium Sport and Vogue Tires do not receive free shipping.